When comparing the two brands visually, they are about the same diameter, but the blu Cigs are slightly longer. Not sure if that is more battery or flavor cartridge. Overall, the V2 Cigs vs blu Cigs was a bit of a tie. The blu disposable menthol flavor was a bit sweeter, but the V2 disposables were still very impressive with the flavor and the vapor production. Either way you go, disposables are the best way to try vaping at an affordable price. If you have tried disposables and you're ready to make the switch to vaping, then analog electronic cigarettes are the next common step. You can use them over and over unlike disposables that only last a few days. You can also choose your flavors in a wide variety of choices.Check out the new line up of starter kits to customize to your style. The Flavor Sampler is the best way to discover new flavors of e-liquid and find the one that works for you. V2 Cigs has several tobacco flavors along with sweet flavors to choose from. * Helps transition to quit smoking. * Tobacco and Menthol flavors. V2 Cigs is America’s No. 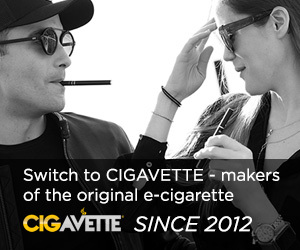 1 online retailer of electronic cigarettes and is the 3rd largest electronic cigarette company in the world. V2 Cigs offers three brands to choose from. V2 which is designed for the smoker looking to put down cigarettes, but still enjoy the pleasure of smoking. VC (Vapor Couture) which is the original e-cigarette for women, inspiring an entire line of fashionable accessories. V2 PRO the world’s most advance vaporizers, representing the ultimate in form and function. V2 Cigs are designed and tested in the U.S. and offer a lifetime warranty, 30-Day Money Back Guarantee, Free Shipping over $50 and Vape4Free customer rewards program. After quitting cigarettes with blu Ecigs, I then tried V2 Cigs Ultimate Starter Kit and was very impressed. The battery was larger than a cigarette, but I gladly gave that option up for the battery power and vapor production. They also offered lots of accessories which was a plus. It contains all the necessary accessories you will need to quit smoking cigarettes. I was very interested to try their new V2 PRO Series 3 vaporizer and was not disappointed. It’s around an eGo size battery, but it’s a 3-in-1 unit. Very cool! Despite it’s smaller size, it still cranks out some nice vapor and is easy to stash anywhere. I also reviewed the V2 Pro Series 7 vaporizer which is my favorite of the two. Both are new 3-in-1 vaporizers optimized for e-liquid, essential oil, wax and loose leaf with one of the fastest heating times in the industry. They are equipped with smart technology that recognizes each cartridge type. Disposable electronic cigarettes (e-cigs) are an excellent way to start your journey from smoking traditional analog cigarettes. That's what I did. I actually went to a gas station and picked up a blu disposable in menthol flavor. I smoked two major brands of light cigarettes for over 20 years so I'm not a fan of menthol, but I'm glad I got them because the flavor was amazing and so was the throat hit. Very comparable to an real cigarette. I wanted to see what else was out there and I saw that V2 Cigs was a popular brand, so I picked up a tobacco regular full flavor and a menthol light flavor disposable. V2 cigs compare their disposables to be equivalent to 40 cigarettes. They are smoke-free, odor-free and Tar-free. • Quitting cigarettes improves health. * Only lasts a few days.